Its Monday and I am so pumped up for the new week. I am in a mood for some motivational post. I like this kind of stuff. I love reading about it and I like to search about it. I love reading stories about successful people who I can relate. I can say that I can be super negative sometimes and I truly regret it every moment of it. I actually love being positive. Although sometimes I can be a real ***** for some situations I can't control. So I am an avid YouTube viewers. I have 3 different account before because of changing my username. Haha. Youtube have so many life lesson to my opinion. YouTube also teach me so many stuff that I wanted to learn. I can't afford to go to art school, and there is these YouTube people love to show tutorial videos online and have helped me a lot. I also have a passion and dream to inspire people in a way that they can be more than they expected. I always believe in that. I don't really like normal life. That is me. Really. I really want especially young girls to be more than they can imagine. Be amazing. Be a passionate fulfilled person. I hope this short blogpost will give you a pumped up start for this new week! 1. Even how good you are, there are still going to be haters. When you watch video, you probably going to notice the like "bar". No matter how good the video is, how matter how positive the video can be, how matter awesome the video can be. There is still a 'thumbs down". So that is life. How good you are, how you does not disturb people's life, you are still going to get a "dislike". So calm down. Don't panic, don't be sad. Its normal. People are just gonna hate. There is always someone who just love to write in hate comments. Because they choose to be negative. Remember that. There is no one in this world can satisfy everyone. Not even a prophet. But if you look properly, which is the most button clicked? Thumbs up right? So yes there are still going to be haters, but, haters are just a small portion in life that we just need to ignore. There is no failure but feedback. 2. Believe in yourself and you never know what future holds for you. Watching Draw my Life videos gives me so much good example. Most of the successful YouTubers does not really comes from a good past. They just doing what they love and believe in. And look at them now. They are freaking successful. You never know what future holds for you. You never know where your talent can bring you. When they starter, 0 views are nothing to them. They just keep doing what they love and what they believe in. Now? They are just amazing so are you. 3. There is no such thing as a perfect life. 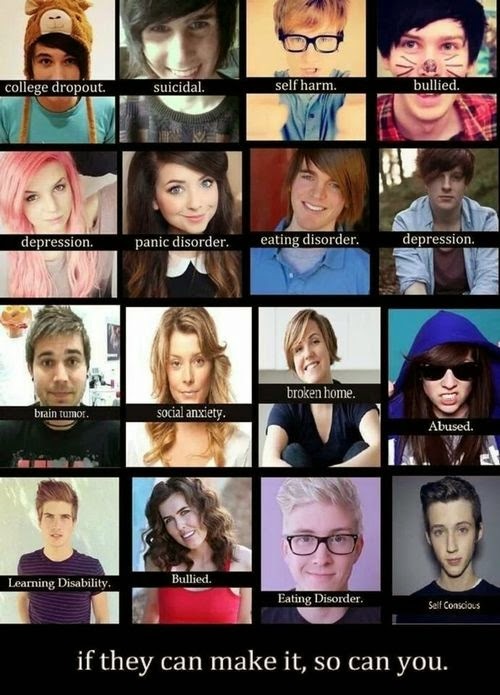 YouTube videos are made from real people. Real people with life. Especially when watching Vlogs. As you can see there are always curses came out from the mouth. They are real people with real life. Messy room, messy hair, uneven makeup sometimes. There are always things does not going as planned. But being positive is the key. There is always a little breakdown in life. There is no such thing as a straight perfect life. There is no happy ending. There is only a rocky road for you to go through in the most positive way. 4. We all have different views. This is one of a topic we need to remember. We always have disagreement about something. Take an example of the comments you can read in each YouTube videos. There are always people fighting, trying to get people think what they want others to believe what they believe. Remember. Not everyone have the same cup of tea as you. Don't go over people life's and tell them what to do. Yes, even in religious views. Prophet Muhammad also does not practice forcing method. He does not go on all people lives and force them to believe in Islam. He does not embarrassed other people for his own belief. He practice to himself and make an example to people who wanted to see. This is just and example okay. Some goes to a basic life stuff. You like orange, and when people does not like orange, you bashed them, Remember that everyone have different views. So respect each and one another and let them decide. 5. Past does not define you. Abused? Bullied? No friends? Ditched? That is only an event. Not a life time problem. Do not blame what happen to you in the past and blame people for what you are right now. There is no failure, but feedback. Everyone makes mistakes, everyone have dark past or stuff that they wish they did not do. What you need to do is, repent to all of the mistakes and start to be better. For things to change, yourself have to change. Not the people around you. Starting from today, be awesome. Cause you already are, and your life need YOU to make it happen. Take the past as a lesson, for you to be amazing. *all pictures obtain from tumblr. "I can be super negative sometimes"
I thought you were talking about me. I have tendency to think like that sometimes too. my dear Sabrina, i think mesti sebab dah lama sangat tak jumpa ni... so ada masa kita rasa down. :) apa-apa be strong sayang! haha xdela.. sab ok.. tp mmg serious rindu korg sgt! WELCOME Blogger based in Selangor, Malaysia. ❤ | Wifey & a Mother | Creative Director & Co-Founder of Breena Beauty Started this blog in 2011, had the best adventure ever! Thank you for all of your support. As for now I am fully focus on my brand Breena Beauty. I will share more about business tips, and some things I love! © Sabrina Tajudin | Malaysia Beauty & Lifestyle Blog. All rights reserved.